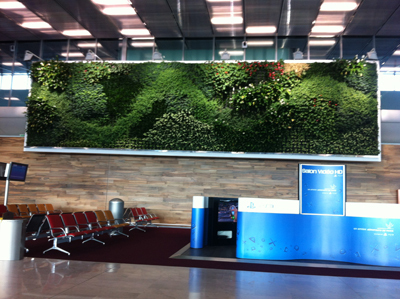 I was about to leave Paris, nibbling on my last macaron bought on a whim at the airport, when I saw this awesome living wall near my gate at Charles de Gaulle. Maybe it’s called a living panel though. The French really know how to make things beautiful, don’t they? I won’t even begin to describe the airport bathrooms! Anyhow, besides this spectacular living wall, I also spied some green rooftops. 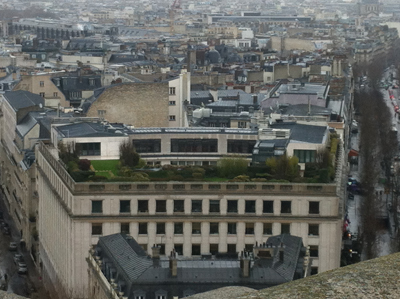 This Paris green rooftop photo was snapped from the top of the Arc de Triomphe. Let it never be said I don’t exercise. That was a tough climb up those nearly 300 stairs, but the view was worth it, even in the ever-present April drizzle. There were other great, multi-level green rooftops as well, but the lighting was a bit of a challenge, and those images are grainy. 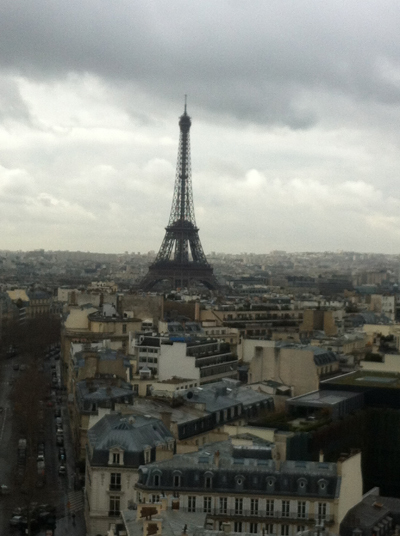 However, I will leave you with the Eiffel Tower on a grey day. And PS, it did rain on each of my five days in Paris, but that was just all the more excuse for a noisette!